I just published a new video in which I talk about the horrible, anti-autistic and ableist book To Siri With Love, written by Judith Newman. The book was published by Harper Collins and it shouldn’t have been. In the book the writer Judith Newman talks about her autistic son Gus in the most mocking way. She has absolutely no respect for her son’s privacy, and she even wants to have the power of attorney to decide for him to have a vasectomy after he turns 18, so that he will never be a father. Besides making photorealistic pencil drawings I also make videos in which i share my experiences as a person with classic autism. My goal of these videos is to teach people about autism from the perspective of a person on the inside. I explain how things work in an autistic mind and give advice about how a more autism-friendly situation can be created. My passion is to build a bridge in between the autistic and neurotypical worlds, and to be a voice for non-verbal people with autism. Now I have published a video about how autism effects my art. 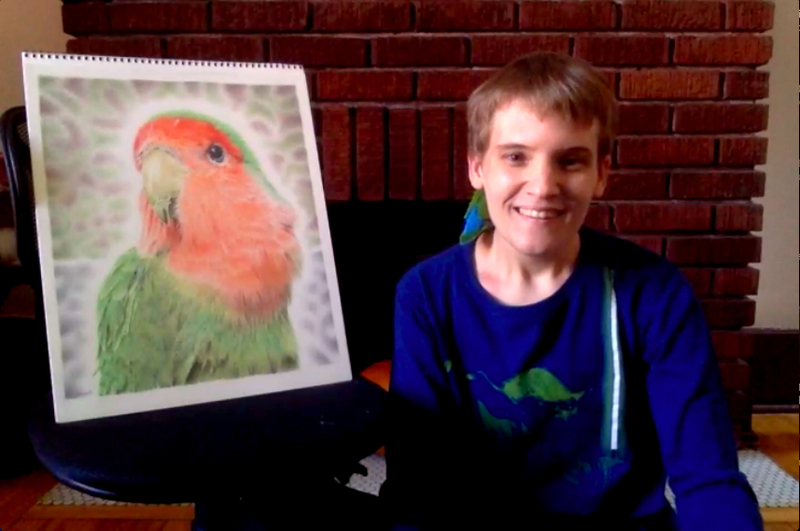 In this video I share more about the process of making a coloured pencil drawing of my little feathered friend Pilaf, who’s also registered as my therapy/help animal. I hope you enjoy it and find it useful. In one of my previous posts I wrote about my project ‘Educational Videos About Autism’ in which I share my experiences as an autistic person. My goal of these videos is to help other people with autism and their families and to raise awareness and understanding about autism. When I look at my past I see a lot of situations which autistic people shouldn’t have to go through, if only there were more awareness and understanding. So I want to build a bridge in between the autistic and neurotypical worlds and to help create a society in which autistic people can thrive. I also hope to be a voice for non-verbal people with autism. In addition to my Patreon page where I publish all my videos, I also created a YouTube channel where I share my videos which are free for everybody to watch. Please subscribe to my channel if you are interested to learn more about autism from an autistic person.